Bennett's Home & Auto Supply, Inc. Enter your address here to get directions to Bennett's Home & Auto Supply, Inc.
"Where Confidence brings you in and Satisfaction brings you back!" Bennett's has remained committed to providing quality products and services that meet or exceed customers' expectations. We explore our capabilities relative to customer needs to enhance the value of our products and services beyond what the customer expects. Quality has always been the top priority in every department of our business and it has always been the standard through which we compare our performance and measure our progress as a company. After 60 years of leadership from the Bennett family. 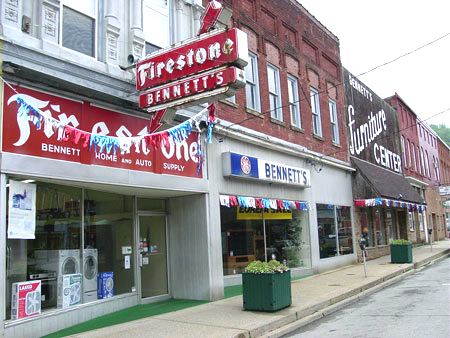 Bennett's Home and Auto Supply Inc. continues to thrive and evolve as a keystone business in downtown Weston. Purchased in May of 1947 by Homer Bennett, the business was incorporated in 1959 and continued to expand its physical location until 1981. © Copyright 2007 Bennett’s Home & Auto Supply, Inc.